I just love midi files. They're small (tiny actually) and can be edited on just about any digital audio workstation out there. For us composers, midi files are a godsend! Unfortunately, midi playback on Windows sounds awful to the point of actually dissuading us from listening to them. In this article, I will show you how you can improve the sound quality of midi playback by installing a free program. Windows has a nice 3MB file called "gm.dls" (which you can find in your Windows/System32/drivers directory) which contains a few hundred wave files that are triggered by the system whenever a midi file is played via the Microsoft GS Wavetable Synth. No, that is not a joke, a three megabyte file CAN have so many sounds, just don't expect good quality! 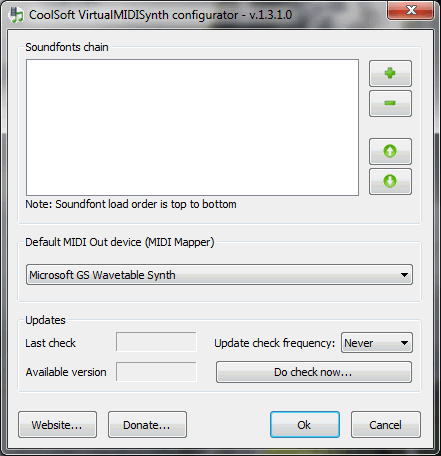 Ok, the first thing you must do is to change the "Default MIDI Out device (MIDI Mapper)" from Microsoft GS Wavetable Synth to CoolsoftVirtualMIDISynth. Once that is done, we need to provide the program a soundfont. 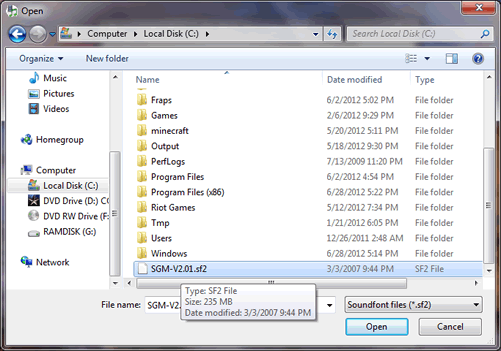 Soundfonts are simply files that contain a collection of wave files used to emulate various pitches of given instruments. In this case, when we will play a midi file, we will hear the sounds in the specified soundfont instead of the ones in "gm.dls", thus the improvement in sound quality. The file is about 235MBs, a clear improvement over the 3MBs of gm.dls! 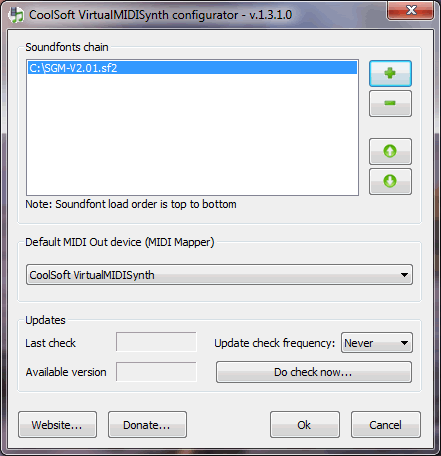 Once you've finished downloading it, you must add SGM-V2.01 to VirtualMIDISynth. To do so, click on the green plus, and select the soundfont you've just downloaded. Click Ok... and you're all set! If you play a midi file in Windows Media Player, you should now have considerably better sound! Note that you may have to restart your computer for the changes to take effect. Of course, these both pale in comparison to the original, but it's a good improvement nonetheless. Even with the new sounds, midi files still don't sound awesome, far from it. Still, I find them to be a lot more bearable with VirtualMIDISynth. I can now finally enjoy listening to onestop.mid!